I've recently tried playing home-made civs using the Krynniac and Torian Tech Trees and was surprised to see that they don't have access to any of the Projects (Military Subsidaries, Research Project, etc.) This means that the game loops on "Idle Colony" (because you can't skip it) when you run out of tiles to build on a planet. The only way around it is to either build-destroy-rebuild or queue a building, but cancel it before it finishes. Somehow, I don't think the AI is designed to handle something like this. Military Subsidaries, Research Project - These have not been a thing for years. Military Subsidies - a thing since 00:35 on January 31, 2019 in the Basic Game (no Crusade or Intrigue). I saw the <Unavailable> tag, but convinced myself that it must be ignored or inactive, since the Projects still showed in the Tech Tree. Disabling the tag restores and activates the Projects, thereby avoiding the Idle Colony loop. 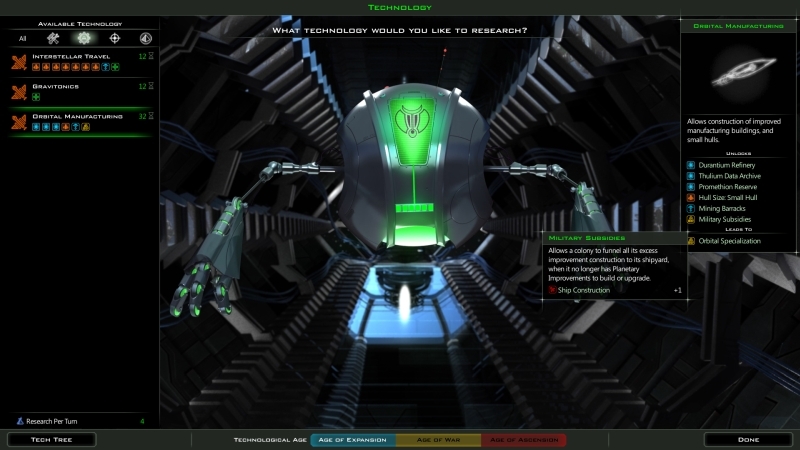 I'll report the bug and ask about AI Research and Aid Economy, since it seems likely that they are supposed to replace the Projects (and prevent the Idle Colony loop), but they're nowhere to be found in my (recent re-) install. Both Aid projects are there in the Vanilla ImprovementDefs.xml and should be showing in game, another bug if they are not.